Mitsuwa marketplace has always been one of my favorite places to shop. 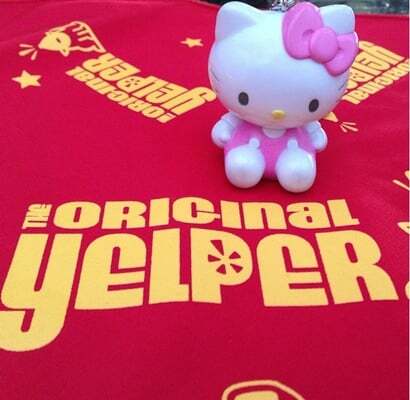 One of the reasons, I love Mitsuwa is because of the huge selection of Hello Kitty items here. Hello Kitty grocery galore ranging from Hello Kitty pancake batter to Hello Kitty Chardonnay can be found here. My poor phone must always be fully charged when I come here because I am forever snapping pics of all the hello kitty nice items. 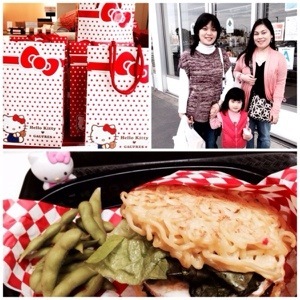 (Do take a look at my Yelp review for Mitsuwa and you will see what I mean about all the photos!) The other reason I love Mitsuwa is because of their food court and all the various eateries there. From the famous Santouka Ramen to the tasty green tea from Yamomotoyama, I am a fan of the variety! When my friend from grad school, Angela, contacted me to say she wanted to meet and have lunch, I suggested Mitsuwa. Angela and her family currently reside in Colorado and were in town visiting. She had mentioned to me that there were not many good Japanese restaurants in Colorado. She also said she wanted to shop for some cute Japanese goodies. Mitsuwa seemed like the place to go! Mitsuwa indeed was a good place to catch up with my grad school friend who I haven’t seen in so long. We spent today catching up, shopping and having lunch. As I mentioned earlier, I am always a fan of the variety at the food court at Mitsuwa. I always seem to spot something new here and lunch today with Angela was no different because I saw that they were offering ramen burgers at one of the places in the food court, Go Squared Takoyaki and Taiyaki. I’ve been wanting to try the ramen burger for a long time now. 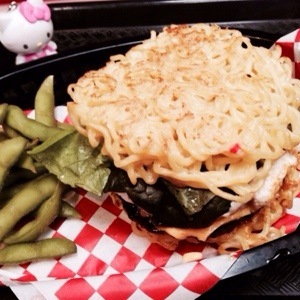 The ramen burger was created in 2013 and grew instant popularity! I’ve witnessed hundreds of people waiting in line before at ramen festivals and at Mitsuwa for the chance to try it out. When I spotted a sign today saying there were ramen burgers being offered, I knew I wanted to try it. After months of wanting to eat one, today was the day. The ramen burger I got came with lettuce, a burger patty, a fried egg and of course, ramen noodle buns. The ramen noodle buns are essentially what makes a ramen burger. Instead of bread that you find in a normal burger, a ramen burger has two fried ramen noodle buns. It is definitely one very interesting looking burger. I expected the ramen noodle buns to be crispy but I was surprised to find that they were soft. It has the same soft consistency that you would find in a regular bowl of ramen soup. It was actually quite interesting eating this because it can get fairly messy because of the noodle buns. The whole time, I was eating this, I was being careful to make sure it didn’t fall apart. As for the inside, I liked the fried egg and well cooked burger patty. It was the egg and the burger that added the flavor to the sandwich because the ramen noodle buns themselves are fairly plain. Tastewise it was just ok but as far as creativity and uniqueness, the ramen burger is indeed a pretty neat food innovation. All in all this day the day was a fun day! Hanging out with a old friend, shopping for various Japanese goodies and finally getting to try the world famous ramen burger! For more smiles, please read my recent Yelp review about the ramen burger from Go Squared Takoyaki and Taiyaki. Hello Grimaldi’s Coal Brick-Oven Pizzeria!